Dog eye infection remedy is more about prevention because we know the good old saying that: Prevention is better than cure. Canine eye infection is one of those areas where dog owners can easily fall short in noticing it before it turns critical. This happens every so often that there is no excuse for not taking extra care and monitoring your pet’s health status on a regular basis. This is a good video below by Roger Wickenden, Veterinary Surgeon, he talks about dog eye infections. As you know the eye is one of the most sensitive parts of a living being. So, in this comprehensive guide (more than 6000 words long – please bookmark this page as it will take you few minutes to read) I will walk you through the basics of dog eye infection remedy. This article will guide you step by step on how to spot and treat most common or minor dog eye infections, and when to seek expert help. These simple preemptive measures will help your dog to live a healthy and happy life. Having a dog gives you a feeling which is much, much more than just owning a pet. You have a loyal companion who will cheer you up at all times with their canine charms. But how often do we forget or many times remain unaware of our responsibilities that stretches far beyond just feeding or exercising them. And that brings us to the most important question: how do you know that your furry friend has an eye problem? Often, the best indication of an eye infection is the clear or muddy discharge from their eyes. Also, reddish cornea or red spots are an easy way to know that your pet has some kind of eye irritation that needs immediate attention. So the idea is to monitor and keep a close eye. But not all water discharge or mild irritation can be deemed as a symptom of an impending eye condition. Now if you are unsure about the different types of dog eye infections and their treatments, please read on to find out more and educate yourself a little bit on the basics. That’s exactly what I did. And I suggest the same for every dog owner. Because you don’t have to be a Vet, we can all learn these simple things easily. Also, there are a lot of safe home eye care remedies you can adopt. Yes, you are right, I got you covered, and I will share those in this complete dog eye care guide. The goal of this comprehensive ‘Dog Eye Care Guide’ is to answer most of your questions regarding effective dog eye infection treatments and most importantly about preemptive care. Like I said before: Prevention is always better than cure. Now there are various reasons why your dog’s eye may be swollen, red or having a discharge. We will now discuss the various dog eye infections, allergies, and irritants. Knowing the cause is extremely important as it comes with symptoms that you can easily spot. Moreover, the causes will help you target in on the right treatment method for your canine friend. The video below by Dr. Jones is excellent because he shares some useful tips and tricks. It is less than eight minutes long. Though the video quality is not great I would definitely recommend you watch it. Viruses: dangerous viruses like herpes, distemper, hepatitis, etc. The most visible sign of a dog eye infection is dog eye discharge. Now there are various types of dog eye discharges. In most cases, the type of eye discharge will give you a clear idea about the cause of the the discharge. If you find a tiny spot of crust or black goop located on the inner corner of the eye, do not worry. It’s perfectly normal. Like humans, dogs also produce tears to lubricate and nourish their eyes. So if any dust or minute particles are lodged in the eyes of the dogs, the tears will quickly clean it up and move the debris to the inner corner of the eye. The accumulation of such particles constitutes the crust that you see, especially in the morning, in your dog’s eyes. Cleaning it is very easy, as wiping it with a damp cloth will do the trick. This is another type of dog eye discharge that doesn’t necessarily means something is wrong. If you don’t notice continues reddish brown discharge from the dog’s eyes, then it is due to the pigmentation present in the tear. In some dogs, the tears will contain a substance called Porphyrin. Porphyrin is a harmless substance. And it turns reddish brown when it is exposed to the air. The only concern with the reddish brown discharge from Porphyrin is the tear stain. Wiping the discharge off with a damp cloth will work fine to remove them. If you see clear discharge from your dog’s eyes, the chances are that it’s due to dog eye irritation or allergies. Dog eye irritation is one of the most common reasons for the clear discharge. Therefore, if you notice a clear discharge from your dog’s eyes, be sure to check for foreign particles resting between their eyelids and the surface of the eyes. Dust and grass seeds are the common culprits when it comes to foreign body accumulation in a dog’s eyes. But if the discharge and moderate squinting or pawing continue after confirming there is no debris, then the next possible reason is a simple irritation. It can usually happen if your dog gets miniature cut on their eye. The best solution for such a scenario is an eye lubricant. It is always a good practice to have a bottle of dog eye lubricant at home. Sometimes you can see that mucus has replaced tears when it comes to eye discharge. The mucus production points directly to Keratoconjunctivitis Sicca or Dry Eye. When there is less production of tears it results in dry eyes in dogs. When you find your dog is having such a condition, immediately take them to a doctor. This is a fairly critical issue that can cause vision loss or blindness if left untreated. We will discuss more on this condition later in the article. The green or yellow eye discharge always points to some form of serious eye infection. If you notice the eye discharge getting yellowish or greenish, then take your dog to a vet for further examination, normally green or yellow dog eye discharge is tied to conjunctivitis or dry eye. As we discussed earlier, there are many causes that lead to dog eye infections. What may first turn out as physical trauma to the eye can easily serve as the perfect place for viruses and bacteria to thrive or infest. Thankfully there are many treatments you can use, both home remedies and over the counter dog eye medicines. We will discuss the most common dog eye infections, their symptoms, treatment and preventive measures you can adopt. And we will look at them in details, so that you gain sufficient knowledge and prevent most dog eye infections. Conjunctivitis is the infection of the conjunctiva membrane. This is a membrane that protects the eye from foreign materials like dust or other kinds of debris. Canine Conjunctivitis is the inflammation of this membrane causing it to swell up and cause a red discoloration. To put it in simple terms, “conjunctiva” means the membrane covering the eye of a dog and “itis” translates to inflammation. If you find your dog’s eye having green-yellow or pus-like discharge, then the underlying cause can be complex in nature. 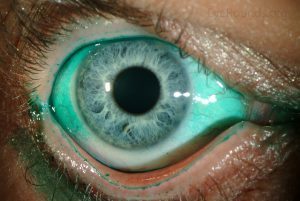 Green dog eye discharge is usually associated with conjunctivitis. Another telltale sign of conjunctivitis is the discoloration of the eye. The light reddish pink coloration of the eye caused by conjunctivitis lead to its popular name Pink Eye. As the condition worsens, you will see your dog pawing its eyes more and more. You will also notice that the eyes are more swollen as days progress. If you leave it untreated, soon they won’t be able to open their eyes completely. So if your dog’s eye exhibits such symptoms, then you need to act fast. Remember that in the worst case scenario, dog eye conjunctivitis can result in permanent loss of vision. So it is better to be cautious at all times. Now there are many ways in which your dog can have eye inflammations. Therefore, we cannot restrict conjunctivitis to just a single cause. The symptoms of Canine Conjunctivitis vary with the severity of the infection. So every symptom may not be visible right away. But as the condition worsens more symptoms appear. Eye Discharge: One of the most notable signs of Pink Eye or Canine Conjunctivitis is dog eye discharge. So, if you see thick and pus-like discharge, you know that the chances are it is Conjunctivitis. Red or Bloodshot Eyes: Reddish eyes are the main indicators of canine Conjunctivitis. Swollen Eyelids: Conjunctivitis is accompanied by the inflammation of tissues surrounding the eyes. This causes the eyelids to swell up. Squinting: The inflammation and swelling render the eyes incapable of opening completely. Pawing or Rubbing Eyes: Conjunctivitis leads to eye irritation, so dogs tend to continuously rub their eyes to soothe themselves. There are many factors that contribute to Conjunctivitis in dogs. Thankfully most of them can be completely treated or prevented. Virus: Canine conjunctivitis can be caused by viral infection, if this is the case, they are contagious, and if you have more than one dog at your home, it’s better to cover their eyes with goggles made specifically for dogs. Or, keep them separate as far as possible. Bacteria: Stubborn bacteria like Staphylococcus or Streptococcus can cause inflammation to the conjunctiva membrane. Canine conjunctivitis caused by bacteria is also highly contagious. Allergic: when debris get stuck between the eye and eyelid, there’s a chance that it can agitate the conjunctival membrane causing it to become swollen and cause also green discharge from your dog’s eyes. Dry Eye: keratoconjunctivitis Sicca or Dry eye can cause inflammation in the eyes that can lead to Canine Conjunctivitis. Trauma: any physical damage to the eye can exponentially increase the chances of your dog being infected with Canine Conjunctivitis. Antibiotics works best when canine conjunctivitis is caused by a viral or bacterial infection. Most likely, your dog will be prescribed a combination of oral antibiotics and eye drops. So, as a dog owner I highly recommend you see a vet sooner than later, especially if you notice any of the symptoms we already discussed above. Make sure to get your dog the prescribed medication right-away as the treatment regime is lengthy. Also, it takes a bit of practice to use eye drops on your dog. The best method will be to relax the dog when you use the eye drops. The recovery process from conjunctivitis is a lengthy one. On average, the recovery time for dog eye conjunctivitis can take up to 3 weeks if it is due to bacterial or viral infection. Always follow directions provided by a certified veterinarian. There are some simple tips and tricks that you can use to treat conjunctivitis right at your home. The video above by Dr. Candy Olson provides some tips on how to take care of our dog’s eyes. Dog Conjunctivitis home treatments include the use of natural ingredients that can be used directly or mixed with other elements to heal the infected eye. Saline water has superb antibacterial and anti-inflammatory properties. The best way to use saline solution is to use it with lukewarm water. The warm salt solution will provide much comfort for your pet when you apply it gently. I would usually boil clean drinking water for five minutes, so that it becomes sterile. Then, pour the water in a clean cup and let it cool down little bit. Then, when it is lukewarm you can add table salt. The application is simple. You need to soak a cotton ball in the warm saline water and squeeze out the excess water. Now you can use the cloth to gently wipe the eyes of your dog. Make sure you do it with a lot of patience and care. Do not press the cloth against the infected eye too much as it can cause the inflammation to aggravate. Another way of doing the same is to splash the warm solution in their eyes and the swiping it clean. This way, the saline solution can go into the eyes aiding in faster recovery. Instead of using salt with warm water, there are many herbal combinations that will help your dog heal faster. The herbal combinations are a great alternative to over the counter canine conjunctivitis treatments. There are several herbal extracts you can use for this purpose. The best ones are Calendula, eyebright, red clover, Chamomile or St. John’s wort. Mix few a few drops of any one of these extracts with lukewarm water along with a spoon of salt. The same application method is same as that we discussed earlier with saline solution. Herbal compress is another version of Herbal eyewash. Some dogs won’t let anyone touch the affected eyes, even their owners. This behavior can be because of the pain they may feel when the owner tries to open their eyes to apply the herbal eye drops. This can be prevented easily by using herbal compress. Soak a soft piece cloth in the herbal eyewash that we’ve learned to prepare in the section above. Then bunch up the cloth to form a tight bundle. Put it over the dog’s eyes. The herbal wash will slowly slip into the dog’s eyes without causing them any irritation or pain. There is another effective treatment that is helpful in treating a dog eye affected by conjunctivitis. This method is also called Chamomile tea rinse. The procedure to make Chamomile tea rinse is very easy. Brew some chamomile tea using a chamomile tea bag. Let the bag sit a while in the tea. After the temperature of the tea is low enough that it’s just warm to touch, remove the tea bag from the tea. Now apply the tea bag around the affected area. The remaining juice in the bag will start to drip down into the eye of the dog. This prevents the infection from aggravating and spreading. Repeating this procedure up to four times per day has shown considerable improvement in the condition. This is due to a chemical called Tannin that is present in the tea. Conjunctivitis can block the lacrimal glands from producing enough tears for the eye. This causes distress and irritation to the dog’s eyes. The best method then is the topical application of artificial tears. It will sooth the eyes of the dog and help in the lubrication of the cornea. This is a really effective method to rejuvenate the eye. Note: Vitamins C and E help in reducing inflammation and inducing better healing capabilities. Give your dog meals that are rich in these vitamins to fasten up the recovery process. Also, mixing 20-30 drops of Echinacea Glycerite in your dog’s water will help a great deal in preventing infections. Echinacea Glycerite helps to rejuvenate the dog’s immune system to fight better against bacterial and viral infections. Home treatment methods for Conjunctivitis in dogs are only effective in the early stages of the infection. They also work in temporarily alleviating the irritation. If you think that your dog is showing no signs of improvement, you should get your pet to the nearest vet immediately. Certain breeds are also prone to conjunctivitis more than others. It has to do mainly with their anatomy. Breeds like bloodhound and Basset have extra folds of skin around the eyes. This leads to the hair directly falling directly into the eye. Some breeds like St Bernard have eyelids that can grow disproportionate to their overall growth. This makes the eyelids sag and exposes the inner lining of their eyes. Breeds like a cocker spaniel and shar-pei tend to have in-turned eyelids. The inturned eyelids can rub against their eyes causing irritations and rashes. Dog breeds like Labradors, spaniels, and terriers are more prone to allergies. This can also lead to canine conjunctivitis. You don’t need to worry your head too much about taking care of your dogs after hearing all the stats. Prevention is pretty simple with conjunctivitis. Since Canine conjunctivitis is caused by debris and infections from an external source, there are a few precautions you can take to prevent it from happening in the first place. Here are some effective tips to take care of your dog that will help you to prevent Conjunctivitis in its tracks. Do not leave out your dog’s eyes while you give your dog a monthly or weekly inspection. Make sure to check the eyes for debris or any foreign particles. Also, you can gently open their eyes with your forefinger and thumb to see if anything has lodged itself in the eye lining. If you find anything, try to remove it immediately with sterile cotton swabs or any other soft materials. Allergies can come in many forms like pollen, chemicals or smoke. You must take extra care to avoid your dog spending time in environments that have such particles in high levels. But this shouldn’t come at a price of their freedom. They must be allowed to spend ample time in the open. Moreover, they should get at least half an hour of workout every day. Vaccinations help a great dealing in protecting your pets from harmful bacteria and viruses. There are diseases that can easily infect your dog’s eyes and it’s better to vaccinate than risking it. This infection has a peculiarity as it only infects the cornea of the dog’s eye. The infection is known as keratitis, to be more specific – Ulcerative Keratitis. Keratitis or corneal ulcer is usually seen in the topmost layer of the corneal epithelium. In worst case scenario. Ulcerative keratitis can lead to permanent vision loss. Fear not as there are symptoms that hints towards this infection. Watch out for these signs, and you can easily save your dog from the effects of Canine Ulcerative Keratitis. There are various causes that we can associate with the oncoming of Ulcerative Keratitis in dogs. The major contributing factors are foreign debris and constant eye irritation. Even though eyes are designed to push out debris, there are chances that foreign particles could get lodged up in the dog’s eye. The best thing to do then is to remove it yourself using the proper procedure carefully. Any physical damage to the eye can lead to Ulcerative Keratitis if it is not properly treated. Having less tear translates to low lubrication of the eye. This will cause friction between the eyelid and eye. If any abrasives are present, it will lead to corneal scratching. Both of which can lead to Ulcerative Keratitis in dogs. If your dog can’t close its eye properly, it will result in the eye drying out. This is especially harmful when the dog sleeps. The inability to blink while sleeping results in the eye drying out faster. The treatment method of Ulcer Keratitis greatly depends on the duration of time it has been present in the dog’s eyes. Ulcer Keratitis results in slow eye damage with each passing second, so the early diagnosis will greatly impact treatment methods and cuts down recovery time. The treatments span across basic ointments to surgeries. Antibiotics and ointments are usually prescribed when the ulcer is at the beginning or maturing stage. You will have to give the dog medicine on time and apply ointment or eye drops until the ulcer is completely removed. But there is a chance of the ulcer penetrating deeper into the cornea if the symptoms are left unattended for too long. Then the dog might have to be hospitalized, or in the worst case scenarios, surgery might be the only way to remove the ulcer. The surgery involves removing the loose cells from the cornea. This is very effective in removing the ulcers from the eye, but surgery usually takes a longer time to heal than other methods. Also is a good practice to use protective eye patch during the recovery. This will prevent your dog from scratching or even touching the post-surgery eye.The pet must be then taken to the hospital at regular intervals to make sure that the healing is taking place correctly and evenly. Or any breed that has a short muzzle and prominent eyes. Since the major reason for ulcerative keratitis or dog eye ulcer is persistent irritation of the eye, debris or trauma, you need to take ensure that your dog is safe away from such factors. But it is unavoidable that at times they may happen, the best course of action then is to get your dog to a veterinarian or apply the saline solution to of the problems isn’t severe. These two cases are predominantly causing your pet eye infections; you must consult a verified veterinarian for treatment. The last resort is a corrective surgery that will surely solve the problem. Now, this is a condition rather than an infection, the reason why dry eye has its own space in the article is that of the fact that dry eye can lead to many forms of dog eye infections. Dry eye in dogs or keratoconjunctivitis Sicca is notorious for causing severe irritation and inflammation in a dog’s eyes. The medical term translates to inflammation of the cornea and its surrounding tissues due to drying up of the eye. Basically, Keratoconjunctivitis in dogs is the condition where the dog’s eye cannot produce enough tears. The Lacrimal gland is a gland in the third eyelid that produces tears. Dry eye in dogs or keratoconjunctivitis Sicca causes the gland to cease the production of the tears. This will directly result in major lubrication problem between the surface of the eye and the inner eyelid. The increased friction causes pain and discomfort in the dog’s eye. Also, the cornea gets its nutrients from the tears that the eye produces. Dry eye can cause malnourishment in the dog’s eyes. The tears are responsible for cleaning the eye of debris and dust. If the dog’s eye is devoid of tears, then these foreign abrasives are going to damage the eye and cause infections. One of the most prominent indicators of keratoconjunctivitis Sicca is the green discharge from a dog’s eye. There are also other symptoms that will give you a rough idea that your dog may be suffering from dry eye. The cornea will be lackluster; it won’t have the glaze or shiny appearance. The most notable indicators for dry eye in dogs is the green discharge from the dog’s eyes and the lackluster appearance of the cornea. The reduced production of tears will result in less lubrication. Hence, the cornea loses its glaze due to low water content. Immune-mediated Cause: The primary cause of dry eye in dogs is probably the most poorly understood one. The cause is an immune disorder in the dog’s body. It is caused when the immune system of the dog starts to attack the cells that produce tears. Hereditary Reasons: The second most prevalent cause is the due to hereditary reasons. Hereditary KCS affects the tear production by either an immune-mediated cause or having the lacrimal gland produce fewer tears by default. Eye trauma: Any physical damage to the lacrimal gland can cause it to produce less or no tears. If the gland suffers any physical damage, there are chances that it may or may not disrupt the working of the gland. Use of Sulfonamides: Sulfonamides are antibiotics that inhibit the growth of bacteria by directly interfering with bacterial DNA. One of the side effects of Sulfonamides is the permanent damage of lacrimal glands. Removal of Lacrimal gland: The removal of the lacrimal gland is a treatment method used for treating the cherry eye. Nowadays most veterinarians have resorted to surgical re-positioning than surgical removal. But if need be, the surgical removal of the lacrimal gland will greatly increase the chance of your dog developing KCS. Congenital disease: This is also a scenario where the treatment options are minimal. A dog having a dry eye or keratoconjunctivitis Sicca from birth will be having lacrimal gland working with reducing effectiveness. Secondary cause: Dry eye in dogs can be resultant of a secondary disease or viral infection. Viruses like Canine herpes or distemper virus can cause dryness in the dog’s eyes. Hypothyroidism and diabetes are also conditions that can cause dry eye in dogs. If the tear production has completely stopped or if the lacrimal glands are incapable of producing tears, then the solution is to use tear replacements. Tear replacements are artificial tears that mimic the properties and functions of natural dog tears. The artificial tears are administered based on the severity of dry eye. If the condition is severe and the eye is dry, the artificial tear drops may have to be used with 2-hour gaps. After the condition has improved, the timing can be varied up to 6-hour intervals. It is best to leave the evaluation to the veterinarian. Permanent disability of the lacrimal gland can be treated with artificial tears, and the treatment span can be a lifelong one. On the other hand, if your dog’s tear-producing glands show no signs of permanent damage, then there are some treatments methods that concentrate on stimulating/rejuvenating the lacrimal glands. Ophthalmic medications like Tacrolimus and Cyclosporine are known to stimulate tear production in lacrimal glands. Most dogs will respond to the treatment within days, and the glands will be back to normal in no time. If the condition is severe, then you must continue on the medication for a little while longer. If the cause of KCS is because of bacterial or fungal infection, antibiotics will do the job just right! There are many trusted over the counter antibiotics and inflammatory drugs available for treating dry eye in dogs caused by bacteria or fungus. Consult a certified veterinarian to know the treatment period and administration dosage. Pro tip: While continuing the medication, its best to wipe your dog’s eyes with a warm wet washcloth. This will sooth the dog’s eyes and help him/her recover faster. Some veterinarians also suggest that doing so will aid in tear production. Like we earlier discussed, the term Uveitis is a mixture of two basic terms. The word “Uvea” means the part of the eye that contains the choroid, ciliary body, and the iris, the word “itis” means inflammation. Canine Uveitis or Uveitis in dogs is the inflammation of any or all the parts constituting the Uvea. The infection has three different names based on the part that is under infection. Anterior Uveitis or Iridocyclitis: It is the inflammation of the iris and the ciliary body. Posterior Uveitis or Choroiditis: It is inflammation of the choroid. True Uveitis or Pan-Uveitis: it is the combined inflammation of all three parts, i.e., Iris, ciliary body, and choroid. Uveitis symptoms vary based on in the part that is under infection. But there are common signs which gives as a means of spotting Uveitis before it spreads too much into the eyes. Uveitis is caused by the damage to the Uvea by inflammation or trauma. The inflammation can occur due to many reasons; we will list out the major causes of Uveitis in dogs. Infection caused by bacteria, parasite or fungi: Herpes, distemper, Lyme fever, etc. can cause Uveitis in dogs. Toxemia: It is a condition where toxins are present in the dog’s bloodstream. Immune-mediated: it is a special condition where the dog’s body produces antibodies against its own tissues. Trauma: The physical impact to the dog’s eyes can lead to very dangerous eye conditions. A traumatized eye can be the breeding ground for many infections and diseases. Local tumors or cancers in the eye: Abnormal growth in dog’s eyes can lead to rupture of the Uvea causing Uveitis. The treatment of Canine uveitis becomes far simple when you understand the root cause leading to this condition. Once the diagnosis of uveitis, the treatment method should not be stopped halfway because there is a risk that the Uveitis can lead to Glaucoma. Proper antibiotics and antibacterial medications works best when the diagnosis shows it as a viral or bacterial infection. If your dog is suffering from uveitis as a result of physical trauma, then anti-inflammatory treatments are a must. Medicines like aspirin and corticosteroid inhibit inflammatory process by a great factor. Normally Uveitis is treated with a combination of ointments and antibiotics. Artificial tears can also be used in some cases if the Uveitis affects natural tear production. There are several homeopathic medicines for dogs that can help in the treatment and recovery of dog eye infection. Homeopathic medication stands as the world’s second most popular therapeutic system. Homeopathic medicine is a combination of herbal/mineral/animal extracts with many parts of alcohol. They have proven to be very effective for humans as well as animals. We will list out a series of homeo medicines that you can use to treat dog eye infection. Before choosing any homeopathic medicine, remember that the treatment plans depend heavily on the symptoms rather than the disease. So do go by our guide or consult a veterinarian to understand which medicine to choose. Euphrasia (Eyebright): It is very effective in treating Conjunctivitis, Corneal ulcer or allergies. It is one of the most effective medicine on our list. The herb is its raw form mixed with water makes excellent eyewash. Arctium Lappa (Burdock): It is antitoxin medicine that will help your dog detoxify itself. It is very effective against toxemia. Chelidonium majus: One of best medicines to choose if your dog has poor immune action. The medicine rejuvenates immune powers and helps in battling infections. Rosmarinus Officinalis (Rosemary): It’s a very effective painkiller that also doubles as a disinfectant. The medicine is particularly effective if your dog is suffering from severe pain from an eye injury or infection. What to Expect At the Doctors? Bacterial Culture: The vet will take fluid samples from the dog’s eye secretions. This procedure will show signs of bacteria after the proper tests. Allergy tests: A series of tests like blood test will be taken to see if your dog is suffering from allergy-related problems. Allergies can lead to wide variety of infections in a dog. Schirmer Tear Test: Schirmer’s test is a common test used in dogs to measure tear production. Reduced tear production can lead to many dog eye infections. Corneal staining: Irregularities on your dog’s cornea will come into view under fluorescent light. This is the most common test for diagnosing corneal ulcers. Blood/Urine tests: Any disease or toxins that cannot be detected by examining the eyes will be spotted when doing a blood or urine test. Ophthalmoscopy: It is the process of using an illuminating device to see into the eye called Ophthalmoscope. An ophthalmoscope can aid to see the retina tissue to spot any irregularities. Eye Dilation: It is the process to open up the iris to easily see inside the eye. The process is completely painless, and variation of this process is usually done on humans for detailed eye inspections. Intraocular pressure measurement: This is a method to measure internal eye pressure. Increased eye pressure leads to Glaucoma. Focal light Source: the focal light source is an examination used to inspect the eyelids and the exterior tissues surrounding the eyes. How to save your pooch from Dog Eye Infections? We all know that dogs are pretty active animals. Whatever you are going to do to get them relax, they are going to jump and run all over the place. And we endorse you to let your dog spend some time like that. There are some precautions that you can take so that when you do let your dog out, you can spend your time worry-free. Here are a few, but very important tips that will help you to keep your dog from eye infections. 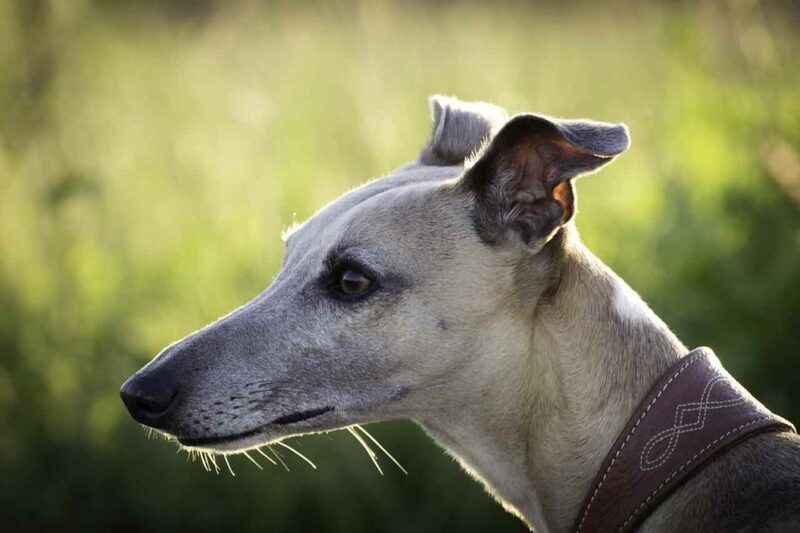 Protection from trauma: Some dog breeds are more active than others. They need some time to play around and flex their muscles. Having no opportunity to so will have harmful effects on them. But puppies are on a whole another level themselves. What this all means is that while they run about, chances of falling somewhere or hitting something sharp is high, especially if they run around your home. If you own a puppy, it’s best to puppy-proof the house. E-collars or protective collars work for both adult dogs and puppies. There are great ways to protect their eyes if they are too active around sharp or hard objects. A clean face: You must ensure that your dog’s face is devoid of debris. You should wash or wipe their face after a day’s workout or before they sleep.0 If they have been playing around in the dust; then you should not delay washing their their face. Proper grooming: We have already gone through the effects that a hair can have on a dog’s eye if it gets trapped between the eyelid and the eye. So timely cutting and brushing their hair now and then will ensure no loose hair. How to properly wipe debris out of dog’s eye? When the dog starts to play or to enjoy their freedom outside, they are always quick to poke their head in all sort so dust and dirt. On days if you see that they are showing signs of irritation, its best to flush their eyes with saline water and then use a dry lubricant. If you still see them pawing their eyes or blinking abnormally, then get them to a vet. Even if clear discharges are a sign of minor issues that you can treat at home, having professional care if the home remedies don’t work is a must. Yes, Dog eye infections are not something that a pet owner should take lightly. In this article, we have listed out the most basic information and details on diagnosing various dog eye infections. As always prevention is better than spending your days at the vet. Even though the causes of eye infection seems to be from everyday objects or elements, not letting your dog out to play can actually do more harm than good. Let your dogs have all the fun they want, just makes sure you properly clean them up later. The precautionary methods and home remedies are a great way for you to step into the world of pet care. But always, if the condition worsens, consult a vet. Owning a dog is not just about the loyalty it has you, it also means that you take your dog under your wings when it’s not feeling good or sick. The result? You are not just getting a pet! You are getting a loyal friend who is going to pledge its loyalty to you. Owning a dog isn’t just fun, It’s a lifelong experience that you’ll surely cherish. BRETT WASIK, DVM , DACVIM-SAIM , ELIZABETH ADKINS , DVM , MS , DACVO. 2010. Canine Anterior Uveitis. November. http://www.vetfolio.com/ophthalmology/canine-anterior-uveitis. Elliot, Dr. Pippa. n.d. The Dog Owner’s Guide to Canine Conjunctivitis. https://doghealthinsider.com/the-dog-owners-guide-to-canine-conjunctivitis/. Foster, Race. n.d. Keratoconjunctivitis Sicca or Dry Eye in Dogs. http://www.peteducation.com/article.cfm?c=2+2092&aid=451. Grajales, Julie. n.d. Home Remedies for Conjunctivitis in Dogs. https://www.cuteness.com/article/home-remedies-conjunctivitis-dogs. Lundin, Deborah. n.d. What Are the Treatments for Uveitis in Dogs? http://dogcare.dailypuppy.com/treatments-uveitis-dogs-6122.html. Staff, AKC. AKC Staff. Dog Eye Infections: Symptoms, Causes & Treatment. 14 April . http://www.akc.org/content/health/articles/dog-eye-infections/. Staff, Canna-Pet. 2017. Dog Eye Infection: Types & Treatment. 18 February . https://canna-pet.com/dog-eye-infection-types-treatment/. Turner, Josie F. n.d. Conjunctivitis in Dogs – Causes and Symptoms. https://www.animalwised.com/conjunctivitis-in-dogs-causes-and-symptoms-232.html. Ward, Ernest. n.d. Corneal Ulcers in Dogs. https://vcahospitals.com/know-your-pet/corneal-ulcers-in-dogs. —. n.d. Keratoconjunctivitis Sicca (KCS) or Dry Eye in Dogs. https://vcahospitals.com/know-your-pet/keratoconjunctivitis-sicca-kcs-or-dry-eye-in-dogs. (1) More About Dog Care and Grooming – You will find more information about how you can care for your dog. (2) How to diagnose canine dog infection – This is a simple and brief step by step from Wiki How. (3) How to stop a puppy from chewing furniture?